The PAE-2900 Remote Power Relay is designed to give the broadcast engineer, studio engineer, or audiophile a tool for remotely sequencing power in a 2-stage cycle, with inrush-limited delay. It has a full compliment of trigger inputs: 9-24VDC, 120VAC, and USB. The unit is rated at 120VAC, 15A total attached load (total of all outputs). 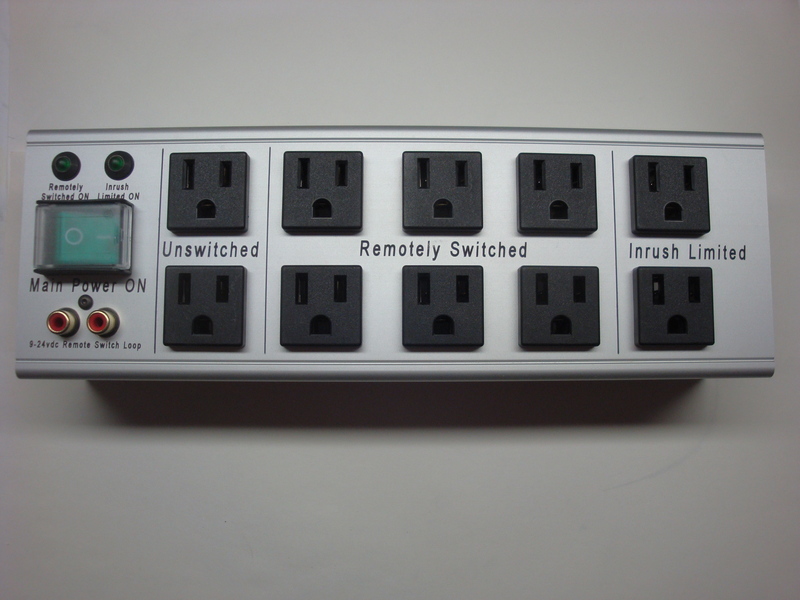 The unit features 10 AC outlets: two unswitched, six remote turn-on, and two inrush-limited delayed turn-on. Allows for correct load sequencing and in-rush limiting to 24A for 1/2 second, after which the inrush-limited output is connected directly to 120VAC. Perfect for remotely turning on amplifiers from a preamplifier accessory AC outlet. Perfect for turning on audio equipment when booting a DAW, by connecting trigger input to a USB port. Automates external equipment turn-on upon computer boot. Interfaces with common 9-24VDC audio component daisy-chain signaling. Transverse and common-mode MOV protection as well as gas-discharge transverse protection. Relay contacts are arc-quenched to allow switching of heavily inductive loads. Master power switch for full system disable with shroud to inhibit accidental shut down. Unlike competing devices which use insulation-displacement connections which can overheat and fail, all outlets are silver-soldered to power distribution bus for enhanced long-term reliability. Trigger inputs: 9-24VDC@3-10ma max., 120VAC@5ma., USB 5V@5ma. AC Input: 120V, 60Hz 15A maximum. 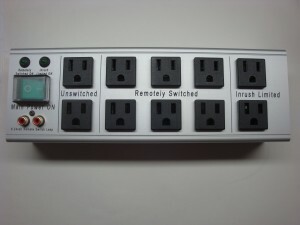 Outputs: (2) Unswitched, (6) Remote switched, (2) Delayed after remote switch with inrush limiting. Output: 120VAC, 15A total all loads.